The worth of a book is to be measured by what you can carry away from it. CRYSTAL WORLD's "Crystal Book" is an ideal gift or award for writers, publishers, educators, journalists or religious leaders. "Crystal Book", crafted from fine optical crystal, will also make make a wonderful corporate, executive or retirement gift; recognition, incentive or sales leader award. 2-1/2" x 1-1/8" x 3"
Etching Area: 2" x 2-1/2"
Gluing & Mounting: $8.00 to $20.00 per item, depending on the size of the surface. 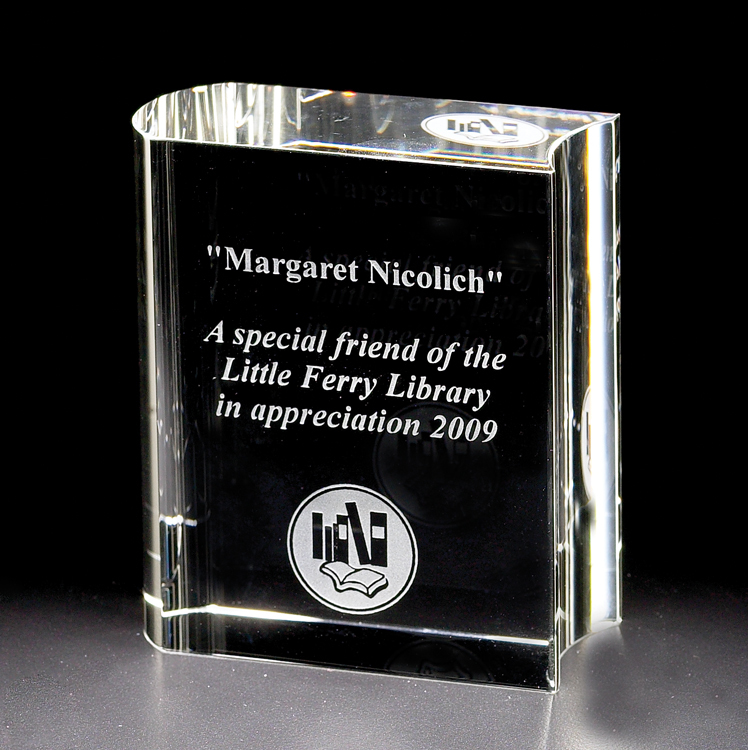 If you select a black glass or marble base, we recommend that we glue a custom-cut mirror between the award and the base, to retain the sparkle of the crystal. Average cost is $20.00.